Throughout the world, many progressive hospitals have begun using fixed C-arms in operating room environments, as opposed to the more popular mobile C-arms. This movement has surfaced as a result of the physician movement towards collaborative surgeries, in which many medical specialists work together to perform complex procedures. The installation of a fixed C-arm system in the operating room allows for the ideal imaging environment for this approach. C-Arms have been used with growing frequency in the medical field since it was released as a technology in the 1950s. Fixed C-Arms are employed for many different reasons. Some of the more common circumstances that might require the use of a C-Arm are: barium studies, fertility studies, therapeutic studies, cardiac studies, endoscopy studies, and angiography studies. Single-plane systems consist of a single C-arm, while biplane systems comprise two C-arms mounted at a 90-degree angle in relation to each other. Fixed C-arm systems are used to guide surgeons performing interventional procedures. Modern flat-panel detector systems provide surgeons with superior image quality when performing complex, time-sensitive procedures. Mobile C-arms are smaller than fixed C-arms, so that they can easily be transported to a variety of settings, as needed. As technology evolves, mobile C-arms increasingly are becoming more and more powerful. While all of this is extremely helpful to for the medical professionals using the medical equipment, it is important to understand the importance of the C-arm to patients, themselves. C-arms are extremely precise in their readings and help to reduce the amount of discomfort that the patient feels. Using C-arms during various surgical or non-surgical procedures helps to minimize the need for more invasive procedures. From a financial perspective, the use of C-arms leads to more cost-effective outpatient care in hospitals, as compared with more costly and time-consuming in-patient stays. The versatility of C-arms is also something that is of primary importance to medical professionals. C-arm machines can be used during spinal, orthopedic and general surgeries; as well as for urological, vascular, neurovascular and cardiac applications. This versatility is just one of the many reasons that fixed C-arms are becoming more characteristically used in the majority of hospitals around the world. 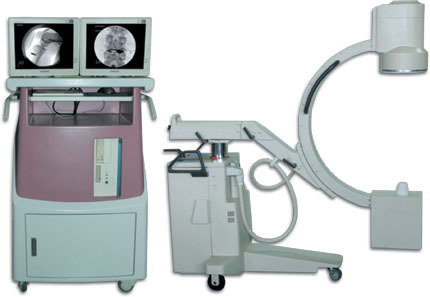 Physicians unquestionably welcome the precise and instantaneous information that C-arm medical equipment is able to report, while x-ray lab technicians can take advantage of the simplicity of the C-arm system and the complex information that it reports so much better than previous technologies. MedWOW is the multilingual, global medical equipment portal: specializing in providing a safe and secure environment for key players in the industry to conduct trade, as well as offering a large variety of related support services. MedWOW currently features hundreds of complete C-arm systems, as well as thousands of C-arm parts in inventories throughout the world. It is also possible to post a buying request on MedWOW to search for a specific new or used C-arm system.